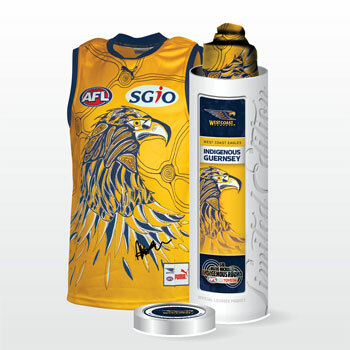 The West Coast Eagles have re-released the highly popular gold edition of the Indigenous guernsey in the lead-up to this year’s Sir Doug Nicholls Indigenous Round showdown with the Gold Coast SUNS at Domain Stadium on Sunday, May 29. In 2014, the club released a unique white version of the design to mark Indigenous Round and it was widely acclaimed as one of the more striking designs unveiled across the AFL. The guernsey, which was designed by Noongar artist Peter Farmer, tells the story of the waalitj (wedge-tailed eagle) which is the strongest totem in Noongar culture. “My artwork includes tracks which connect to six fresh water sources throughout the state of Western Australia,” Mr Farmer said when outlining the story of the jumper last year. The traditional Noongar dreaming story, in short, is about a great drought; the animals and Noongar people could not find any freshwater sources. The waalitj’s eye was the only one that could find water from searching high up in the sky. The Noongar people followed him at this time of great hardship and adversity, and always found a fresh water source. The moral of the story is through great adversity, the waalitj finds a path. His strength and power is respected and revered throughout Noongar country, because of his capacity to not simply overcome adversity, but to succeed in places that others fail. The club lists the Indigenous Round match at home as one of its priorities every year as it gives West Coast the chance to pay homage to Indigenous players and fans for their contribution over the last 30 years. 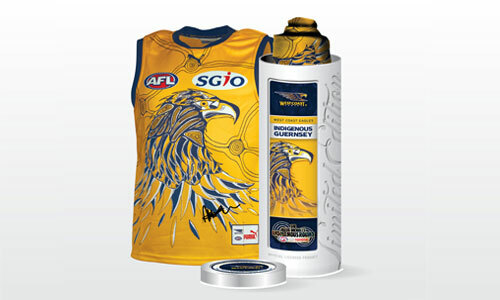 The player issue guernsey will be signed, back and front, and delivered to you in an exclusive presentation tin. The guernsey will also come with a certificate of authenticity. Please allow up 5 - 6 weeks from the closing of the auction, to receive your piece of West Coast Eagles History. ** Please note that the artwork used is conceptual artwork only and the final version of the product may change.